First things first: what do you think of Runaway In LA's new look? It's about time my blog gets a necessary facelift (and I might have slaved away until 6 AM to perfect every detail. Much love to Pipdig for the design!) Lately, I've been drawn to the clean, miminal feel⎯not only in my wardrobe, but for my blog too. Right now, I'm thinking: who have I turned into? In high school, I wouldn't have been caught dead in a monochromatic palette. And simplicity? Pretty much non-existent. College sure does change you... except when you mix procrastination with 9AM classes, you have no choice but to embrace the bare necessities. As for announcement number two? Hint: it involves Breton stripes, pâtisseries, and Hotel Chevalier... I'll let the title of the post do most of the talking, but Runaway In LA may be heading abroad very soon! My latest obsessions, naturally, reflect this certain theme. Aaand, wanderlust mode has officially been activated. [un] PRETTY NOTEBOOKS - Eons ago, I was a die-hard Five Star addict. Zipper binders, pencil pouches, you name it, I had to have it. Except now, I've matured to Instagram-worthy notebooks as my classroom must-haves. Currently, I'm lusting after this Paris skyline notebook by Marc Jacobs. Perhaps this will even make my pre-calc notes look more humane! And post-finals, it would make the perfect travel journal, don't you think? [deux] FUJIFILM CAMERA - Instant photos? Yes please! While I swear by my trusty iPhone, physical snapshots are the real deal. Apart from achieving ultimate hipster status, there's nothing more I want to do then innovatively display my photos on a string of fairy lights, complete with a Tumblr white bedspread. But really, for sponatenous weekend getaways and capturing everyday memories, a portable (and adorable) camera is the way to go. [trois] (STYLISH) PASSPORT HOLDER - My bank account would immediately disintegrate at the thought of a $78 passport holder... but in another dimension, this would be a reality. 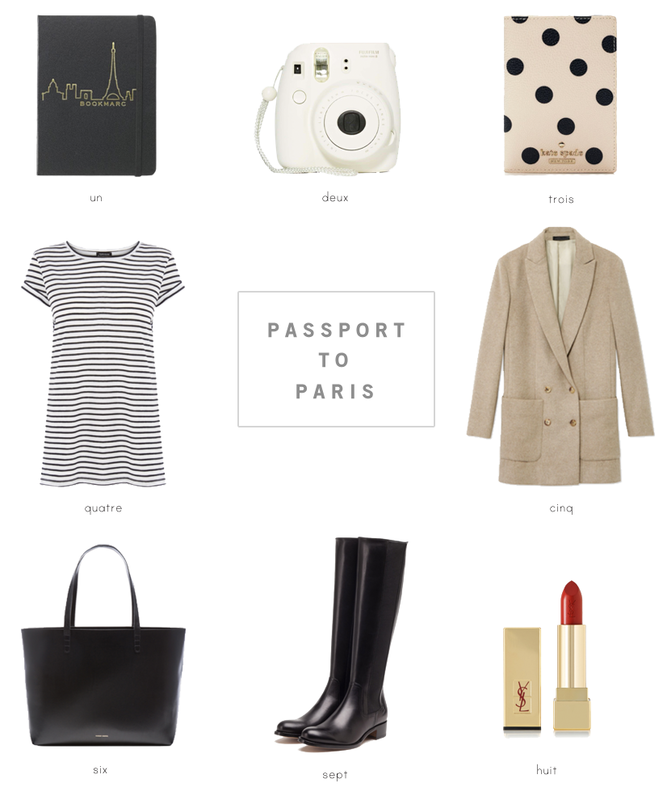 Of course, when you mix Kate Spade and traveling, the end product is a swoon-worthy outfit for your beloved passport. Stamps and polka dots have never looked better. [quatre] STRIPED TEES - I've been on a striped tee kick lately, even to the point where I've worn the same one twice in a week (oops). Timeless, versatile, and the epitome of Parisian chic, striped tees prove to be the true remedy to any wardrobe dilemma. I particularly love pairing my tee with a denim jacket for an effortless get-up, or when I want to mourn the demise of my GPA, I'll throw in a leather jacket for the all-black look. Next up on my dream team? A striped tee-shirt dress, aka amping this obsession to the next level. [cinq] MENSWEAR-INSPIRED COAT - This fall, my outerwear game draws inspiration from boarding school prep. A blazer-style coat balances masculinity with simplistic elegance, and is perfect for polishing up any casual ensemble. Not to mention, 99% of every NYU girl seems to own one, so by law, I must also seek one of my own. Bonus points: combine the coat with a striped tee, boyfriend jeans, and Chelsea boots for the ideal city uniform. [sept] RIDING BOOTS - Yes, ankle boots are highly addictive, but when Polar Vortex Version 2.0 hits, riding boots will become my shoe savior. I've hunted high and low for the right pair, but haven't had much luck unfortunately. Is it really that complicated to locate a simple black pair? Every other New Yorker must share the same novel idea at this rate. [huit] RED LIPSTICK - When it comes to the beauty department, I've surprisingly embraced a new routine: lip products. Normally, I can survive with just a swipe of my favorite Fresh Sugar Lip Treatment, but as of now, I've entered the experimental phase of lipsticks. For an authentic French kiss, one can never go wrong with a rich rouge by Yves St. Laurent.